Dates are from Saturday, September 7 –Saturday, September 14, 2019. The cost is $250 plus the charter rental cost, or rent a cabin on a captained boat. 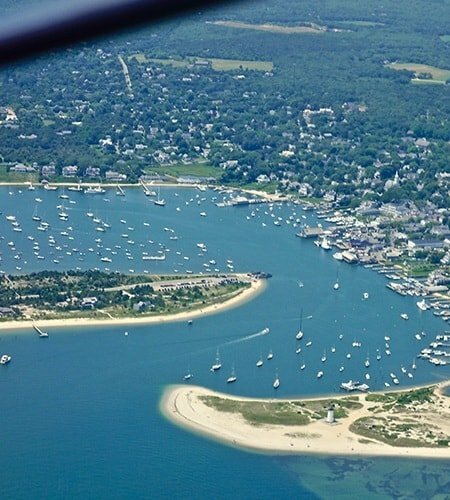 Let’s go to Martha’s Vineyard and the Cape Cod Islands! Captained by an ASA instructor who has sailed these waters for over 30 years. September is the BEST month to see these quaint New England villages. 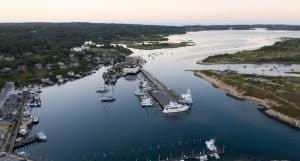 We will stay in the harbors of Cuttyhunk and Vineyard Haven, plus visit some of the historical towns in Rhode Island including Newport and Bristol. You can count on incredible seafood, lots of history, and fabulous winds for sailing. Playground of presidents, film location of “Jaws”, and vacation home of Carly Simon, Dan Aykroyd and so many others.. This area has fascinating history, has a very eclectic mix of lifestyles and interesting people, and wonderful harbors to either relax with tranquility or party with the best of them. You will not be bored. 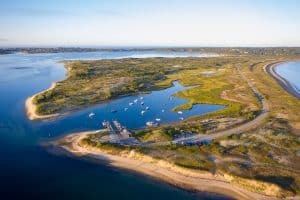 Martha’s Vineyard is one of a cluster of islands formed when the last glacier grounded to a halt 10,000 years ago. Lots of rocks around here, and fog, some very strong currents and 20 miles of ocean to get there. You need to know what you are doing. All that said, it is one of the most special cruising grounds in the United States. If you love seafood you will be in heaven! The gateway to the area is Cuttyhunk Harbor. Getting to Cuttyhunk from Narragansett Bay is straightforward with little current and open ocean. From our base it Barrington it is 35 miles, so it is a full day, but not an exhausting one. If you break it up with an overnight near Newport it is an easy hop. We’ll meet at the charter base on Saturday, September 7. We’ll get you settled in your boat with an orientation and you can do your provisioning at the supermarket less than a mile away. 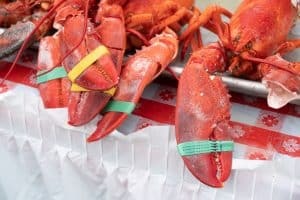 Dinner will be a New England clam bake with fresh steamed lobster as we all get acquainted followed by an instruction seminar of where we will be going, what there is to see, what to expect with weather and what the sailing/cruising environment will be like for the week. Martha’s Vineyard has strong currents, rocks, and is a challenging area to cruise in, but in a flotilla environment you will safely navigate the waters and build your cruising skills. Flotilla will be back at home base on Saturday, September 14. Sail on a captained catamaran or a monohull. We will have a 44’ catamaran with 4 private cabins and 4 heads available captained by an ASA instructor who has sailed these waters forever, and a captained 1991 Hunter 43 (with local ASA instructor) with two and a half heads and three cabins. You can either build your skills; or lay back and enjoy the sights. Meals and chores will be rotated among the crew and guests so it will be evenly shared. Getting ASA certification for various courses is available including Cruising Catamaran. All our charter boats will be on a Saturday to Saturday schedule for this week! Get 8 days for the price of 7! We will also have a number of mono-hulls or cats for bareboat charter from 30’ to 51’ where we will go as a group making the navigation and currents easier to manage. There will be daily briefings of what to expect the next day, or you can go off on your own for a bit and then catch up. We Sail from Barrington, RI which is near Providence, RI so we are only a 20 minute ride from the airport and even less from the train station. Narragansett Bay is a delight and we will sail through it on the way to Martha’s Vineyard and explore it on the return trip. We will visit tiny villages and good sized towns. We will pause at some of the places to shop or sight see, or you can take a side day trip. 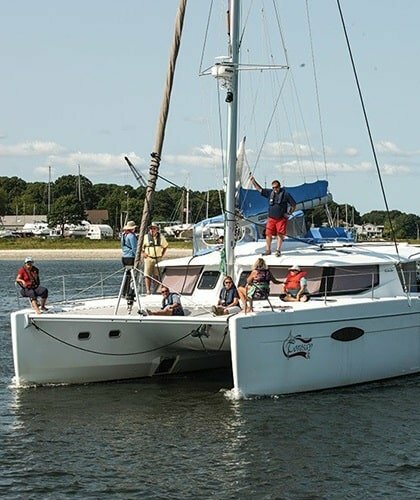 The flotilla is hosted by Narragansett Sailing School’s owner Mary Goff. Mary runs the business and has extensive cruising experience and will do the trip planning with you the first evening. * Includes all boat expenses except food. Cost is the published charter rate of the boat chosen plus $250 per couple. Pricing includes the clambake Saturday evening, but excludes other food expenses during the week. It does include all seminars and briefings, and memories of a fantastic cruising experience. You arrive at the charter base In Barrington, RI during the day and get comfortable. 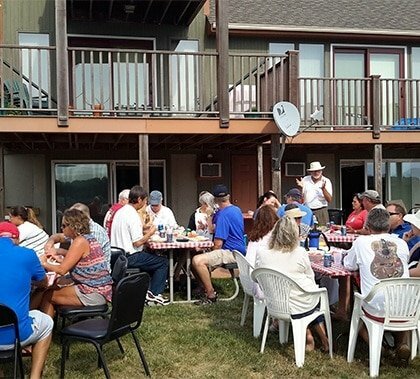 Stay at the slip, get provisioned with the grocery store a few steps away, go the marina swimming pool, look over the charts, and get organized for the morning departure. New England clam bake that late afternoon is included and we’ll have a nice presentation of what to expect during the week including chart briefing. Up and at ‘em early and take off for Cuttyhunk Island. Mornings in Narragansett Bay are usually calm winds, so you motor down the bay, over to the Sakonett River, and down to the ocean. The winds start to pick up around 11:00 which is about when we leave the bay turning towards Cuttyhunk . You have a broad reach up and over the ocean swells and arrive at the island around 3:00 PM. You pick up a mooring (they have about 50 of them inside the harbor and about 20 outside.) Cuttyhunk is a completely protected harbor and is the land that time forgot. One room schoolhouse, cell coverage is weak, seafood market on the main pier with the freshest seafood anywhere, and a delightful village to explore. This was a village before Plymouth colony was founded in 1620. We wander out of Cuttyhunk to the Vineyard. We must head down a bit of Buzzards Bay to “Quicks Hole” to cross between the islands to get to Vineyard Sound. This town is the commercial center of the island. With the normal Southwest winds it is comfortable harbor. Lots of moorings to rent outside the breakwater. Inside the breakwater the harbormaster (channel 9) may be able to accommodate us with a mooring, or there are slips at the Black Dog Wharf or Vineyard Haven Marina for about $5/foot. This is a tourist town. Lots of restaurants, shopping, grocery store, as well as the Martha’s Vineyard Museum. This is an interesting place to just sit on the boat and watch the ferries, classic boats, and all manner of harbor activities going on. Only an 18” tide here, 4 feet in Newport, and 8 feet in Boston. Go figure. Now for something different. Just a few hour sail to a sleepy little harbor/village with complete protection, but with a wonderful sandy beach! A place that makes Cuttyhunk look like a big city. Maybe I am exaggerating, but Menemsha is a special place. Menemsha is part of the town of Chilmark, and is the remote end of the island. It is where much of the filming of Jaws took place, and not far from the Gay Head lighthouse. It has a seafood market that will steam you up some lobster and clams and you feast on their picnic table. You can take your dingy to Menemsha pond, or rent bicycles and wander around. Newport is the next destination and it is about a 25 mile sail from Menemsha in the Atlantic. Almost no current in this leg, so it is an easy trip. We will arrive in Newport Mid-Afternoon and pick up a mooring. So much to see and do here. Tour a mansion or two, hit a museum, taste the cuisine, or just gawk at the setting up of the Newport International Boat Show. Only 10 miles up the bay from Newport, so a just a short sail. If I am going to spend a day or two in Narragansett Bay, my choice would be in Bristol or in Potter’s Cove near Bristol. Bristol is not a tourist town; it is an interesting mix of history, great restaurants, interesting architecture, and a wonderful maritime museum. It would be very easy to spend several days here. …and my goodness Quito’s restaurant has SUCH good seafood! Potter’s Cove is across from Bristol on Prudence Island. It is nestled in a nature sanctuary with walking paths and, well; nature! Go swimming here, or clamming on the gravelly beach. I personally spend more time at Potter’s Cove than anywhere on the bay as I love the tranquility and serenity if offers. Or if you like we will have a van bringing folks down to the Newport Boat Show for the day. This is the largest boat show in the Northeast with tons of sailboats in the water and boat equipment galore. Time to head back to home base in Barrington. From Bristol or Potter’s Cove it is about an hour and a half back to Barrington and planned arrival is about noon. Pull right up to the fuel dock and our crew will meet you and get you squared away. You can spend the night at the marina or head off that evening depending on your schedule. Interested In Joining The Martha’s Vineyard Experience This Year?